In my previous risotto posts I have made a point of discussing how to achieve differences in flavor and texture by how and when you choose to add the vegetable garnish (cooked vs. raw…at the beginning, middle or end…). But stirring a vegetable into a risotto isn’t the only way to alter the way in which the dish is perceived. Just as you can serve risotto topped with a portion of cooked meat or fish, you can also serve a risotto with an attractive portion of a cooked vegetable—making it so that one vegetable becomes the star of the show, rather than just one of many supporting players. I have to admit though that sometimes creating a beautiful plate isn’t at the top of my list for a weeknight meal (neatly and cleanly plated is usually more than sufficient) and I am much more likely to go to this extra step for a client’s dinner. However, sometimes at my own table find that I have a special and beautiful vegetable that I want to highlight a bit…so it doesn’t get lost in the crowd. Examples include a few spears of fresh asparagus, just picked from a friend’s field…local fava beans (a rarity indeed in my region)…morel mushrooms that are so expensive I can only justify purchasing a few…etc. This is a great time to make a risotto with complimentary flavors to act as a bed/background for your perfectly cooked, special item…which then gets perched right on top for all to see. I used this approach recently to highlight the beautiful oyster mushrooms that a new purveyor has been bringing to the winter farmer’s market. I used to consider oyster mushrooms a run-of-the-mill grocery store item. Sadly they have disappeared from my local stores. Since they are a favorite of mine I was excited when I found out that they would be coming to my farmers’ market…and even more excited when I saw the wide variety on display: Blue oyster, Pearl oyster, Elm oyster, etc. This winter I have enjoyed these mushrooms in pastas…and on pizzas…and recently on top of this leek and prosciutto risotto. 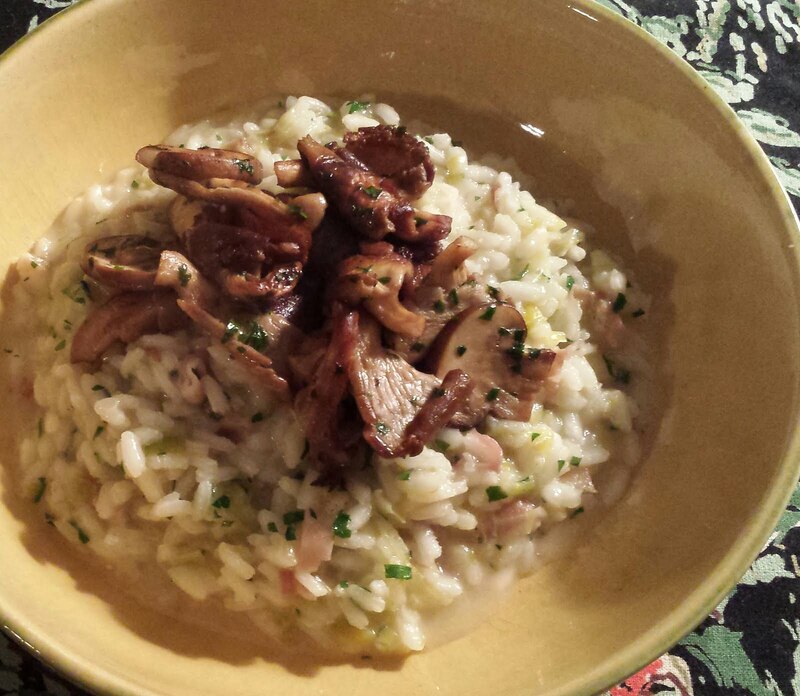 I made this risotto just because I wanted to show off these wonderful mushrooms. I could of course have just stirred them into the risotto—and it would have been delicious. But it wouldn’t have been nearly as beautiful—or as much of a celebration of this wonderful ingredient. If you are new to risottos…or sautéing mushrooms…before you begin check out some of my previous posts on how to make risotto (where I go into the details of the process and the goal) and on how to sauté mushrooms. And if you don’t have access to oyster mushrooms, this dish will still be delicious with whatever mushrooms you are able to find—the sweet leeks and salty prosciutto are a wonderful backdrop for the savory mushrooms. 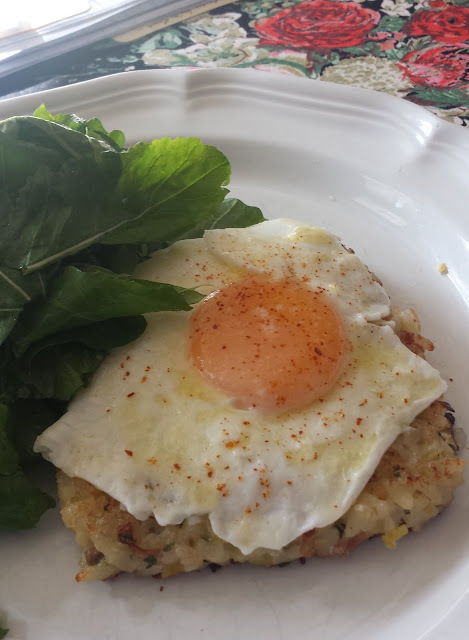 and topped it with a softly cooked egg (poached or fried), you are missing out. Make sure that you make some extra risotto, just so you can have this glorious concoction for lunch the next day. After tasting it, you will probably find yourself making extra risotto on purpose.. Prepare the leeks: Trim away the root and the dark green portion of the leeks. Cut the white and pale green portion in half lengthwise. 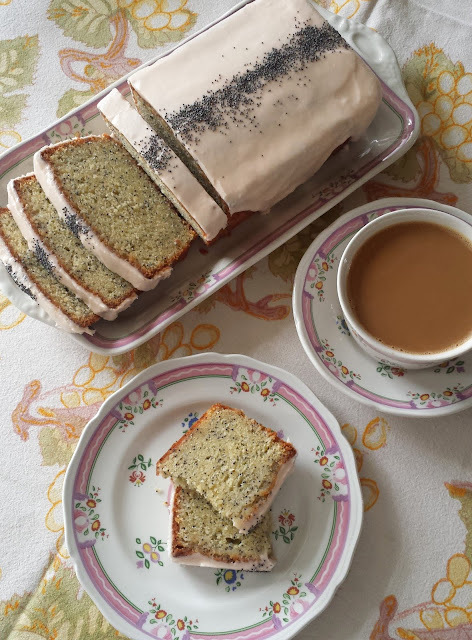 Slice each half thinly crosswise (about 1/4-inch thick). You should have 3 1/2 to 4 cups of leeks. Rinse the leeks well in several changes of water to make sure that they are entirely free of soil and sand. Heat the butter in a heavy medium saucepan (preferably one that is wider than it is deep) over medium heat. Add the leeks along with the shallots and thyme and sweat until the leeks have wilted and the shallots are soft—about 10 to 15 minutes. Add another tablespoon of butter if the leeks seem dry as they cook. Add the rice and continue to cook for a minute or two until the rice is well coated with the butter and is sizzling a bit. Add the wine and cook until the pan is nearly dry. Begin to add the stock. 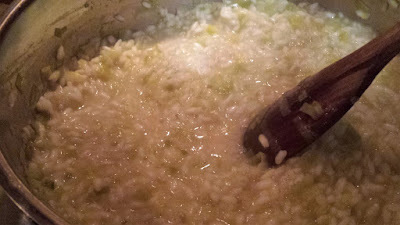 Add enough so that the stock is at the same level as the rice in the pan—the rice should move freely, but not be ‘swimming’ in the liquid. Adjust the heat so that the rice cooks at a slow simmer. Stir occasionally and regularly (this will enhance the creaminess of the final risotto.) When the pan is nearly dry, add more stock and season lightly with salt & pepper. Continue to stir and cook the rice, adding more stock and seasoning lightly as each addition is absorbed. While the risotto cooks, sauté the mushrooms: As always, when sautéing mushrooms, do not over-crowd the pan. If necessary, sauté in batches. Heat a non-stick sauté pan over high heat. Add a thin film of oil to the pan. You should see a wisp of smoke if the pan is hot enough. Add the butter and the mushrooms. Cook, shaking the pan occasionally, until the mushrooms are browned, tender and any liquid that they have given off has evaporated. Season with salt and pepper. If sautéing in batches, transfer the mushrooms to a plate and repeat with the next batch. When all of the mushrooms have been sautéed, return all of the mushroom to the pan and heat through. Add a splash of the stock to the pan (or use water or white wine if you have used all of the stock for the risotto) and allow it to reduce around the mushrooms. Toss in the parsley. Taste and correct the seasoning with salt and pepper. Set aside until the risotto is done. Reheat briefly if necessary before serving. 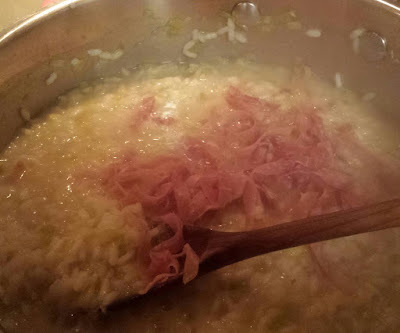 When the rice is al dente—about 18 to 20 minutes from the first addition of stock, stir in the prosciutto. Remove from the heat and stir in the butter, cheese and parsley….and adding more stock as necessary to achieve a fluid consistency. If you are unable to find oyster mushrooms, any favorite mushroom (crimini, white button, shiitake, chanterelles, etc.) will work. For mushrooms other than oysters, trim and slice 1/4-inch thick before sautéing. Pack the left over risotto into an oiled dish, spreading about 3/4-inch thick. Let cool and then cover with plastic wrap and store in the fridge. Fry the cold risotto in a cast iron (or other nonstick skillet): melt some butter over moderate heat. Cut a portion of the cold risotto and carefully lift it out of dish with a wide spatula. Place it in the sizzling butter with the top side down. The top will be dryer than the bottom (which will be a bit gooey) and will be less likely to stick or fall apart. When the first side is golden brown and crispy, carefully flip the cake and brown the second side. Serve topped with a poached or fried egg.